President Obama may be a big college basketball fan—although the president’s tournament bracket is just as busted as most hoops fans—but it’s college hockey that will take center stage in the nation’s capital on April 9-11. The Frozen Four—college hockey’s answer to basketball’s Final Four—will be played in the Verizon Center in Washington, DC, and it will have a distinctly New England feel. Boston University and the University of Vermont will square off in one semifinal on Thursday, April 9, and one of those Hockey East powers will play the winner of the other semifinal between Miami (Ohio) University and Bemidji State University on Saturday, April 11. Boston University has partnered with Anthony Travel to provide packages with hotel accommodations, transportation, and airline reservations. Call 877-284-2254 or visit the Anthony Travel web site for more information. Game tickets are not included in packages. If you want to put together your own travel plans, non-stop airfares between Boston and either Dulles, Reagan Washington National, or Baltimore-Washington airports can be found for less than $200. Tickets to games are available on StubHub and other online ticket sites, and they are being distributed to students and season-ticket holders at the four participating schools. The only tickets being sold on Ticketmaster at the present time are for the Frozen Four Skills Challenge on Friday, April 10. Practices will be open to the public on Wednesday, April 8 and Friday, April 10. For more information on Frozen Four events, click here. Start whistling Sweet Georgia Brown. The Harlem Globetrotters, fresh off their appearances with Scooby Doo and Gilligan, take to the parquet tonight at 7 PM at the TD Banknorth Garden. Their opponent tonight will be the lowly Washington Generals, who have lost their last 12,861 against the Trotters. Law of averages says the Generals are due tonight, right? If you're brackets are busted, might as well throw some good money after the bad and take the Generals and the points. Of course, the Harlem Globetrotters have played the old and new Garden many times. In 1958, they even played members of the New York Football Giants. But what may be hard to believe is that the Globetrotters once played in the shadows of the Green Monster. On July 29, 1954, the Globetrotters defeated George Mikan's U.S. All-Stars 61-41 in front of 13,344 fans at Fenway Park. Now that outdoor hockey is making a comeback, maybe outdoor hoops can as well. The WNBA had an outdoor basketball game in New York last year, so it's been done. Maybe we can get the Globetrotters to play their next game in Boston back in the great outdoors. Or better yet--a pre-season Celtics game at Fenway. Hey, no paint job would be needed for the Green; Fenway's walls already match those of the home team. More stories on Boston's basketball history are contained in The Die-Hard Sports Fan's Guide to Boston. And if you get an extra ticket, let me know! Will the Curse of the Colonel Go the Way of the Curse of the Bambino? 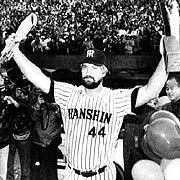 But leave it to the Hanshin Tigers, which is often considered to be the Japanese version of the Red Sox due to their hallowed ballpark, die-hard fans, and championship droughts, to have a curse that's finger-lickin' good. The Tigers have been afflicted by the "Curse of the Colonel" ever since 1985 when a group of Tiger fans celebrating the team's victory in the Japan Series dunked a statue of Colonel Sanders from a local Kentucky Fried Chicken into the Dotonbori River. Apparently, the fans thought the chicken magnate bore a resemblance to Tigers star Randy Bass, another bearded American, (not sure I see the similarity, but perhaps a little sake may have involved in the celebration) and there is a tradition among Tigers fans to take a dip in the river to celebrate victories. Well, apparently the only thing the Colonel dislikes more than divulging his Original Recipe is hanging out at the bottom of a muddy Japanese river. Ever since the dunking, the Tigers have failed to win another Japan Series. Well, that may change now that the Colonel has been located and salvaged. The Colonel was missing his legs, his hands, and his glasses ("It's just a flesh wound!") but he cleans up nicely. Here's hoping Harland Sanders doesn't hold a grudge as long as the Babe. If form holds tonight at the Hockey East Championships, Boston University and Northeastern University will square off on the ice tomorrow night with the league championship on the line. As with BU and BC, familiarity--and proximity, the schools are about a mile apart--breed contempt. But if you think animosity between BU and Northeastern is a new phenomenon, think again. Northeastern adopted the “Huskies” nickname in 1927, and its first live mascot, “King Husky,” appeared on campus on March 4 of that year. The regal name was fitting, since the King was descended from sled dog royalty; his father was the lead dog on Leonhard Seppala’s famous team that rushed diphtheria serum across 645 miles of rugged Alaskan land to save the stricken village of Nome, an event that is commemorated by the annual Iditarod Great Sled Race. Upon their arrival in Boston, more than two thousand students and the university band greeted Seppala and the Siberian husky at the train station. The dog and the throng then paraded through the streets of Boston to the Northeastern campus, where the new mascot was presented with a “roads scholarship” for his experience on the Alaskan highways. Unfortunately, there was some ugliness on the parade route as it passed through the Boston University campus and enemy turf. BU students weren't very deferential to the new monarch and as many as 700 of them jamming the steps and windows of the business school building pelted the procession with eggs, vegetables, and snowballs. According to an account in the New York Times, "Except for the self restraint of the marchers a serious clash would have resulted. Seppala had to dodge to evade the missiles that showered the float on which he rode with his dog, an eskimo, and several co-eds. Frozen snow was showered on the band and succeeding sections of the parade were pelted with missiles. Women and girl spectators received much that was badly thrown, hats and coats being spoiled by broken eggs. Each volley was countered by the marching students with a cheer for Boston University and they kept marching. When the Northeastern boys took the punishment jokingly and refused to retaliate, several Boston University students tried to stop the missile throwing by calling for cheers for Northeastern." The ambush was planned because there were reports that Northeastern students were to carry signs deriding BU. The signs had been made, but they were destroyed on orders from the Northeastern authorities. Hopefully, there won't be any reports of students wielding rotten produce at the Garden this weekend. More stories such as these (and more on BU and Northeastern athletics) can be found in my new book, The Die-Hard Sports Fan's Guide to Boston, due out in June and currently available for pre-order on Amazon.com. If you're more of a puckhead than a hoops fan, it doesn't mean you have to miss out on the Madness of March. This weekend, Boston plays host to some of the best men's and women's college hockey teams in the country. The Women's Frozen Four comes to Agganis Arena with semi-finals Friday (Minnesota-Duluth vs. Wisconsin and Mercyhurst v. Minnesota) and the championship Sunday at noon. Tickets are $24.50 for each session and available through Ticketmaster. The men will take to the ice at the TD Banknorth Garden for the Hockey East Championship on Friday and Saturday. The Friday night semi-finals feature Northeastern vs. UMass-Lowell followed by BU-BC at 8. The winners square off Saturday night at 7 PM with a berth in the NCAA Tournament on the line. Tickets range from $17-$39 and are available through Ticketmaster. If you ever wanted to sit in those swanky club level seats at the Garden, this is your chance to do so at a reasonable price--$39. As of this morning, club level seats were still available for Saturday night. Boston-born Henry Knox is undoubtedly one of the unsung heroes of the American Revolution. Knox played a pivotal role in the evacuation of Boston in 1776. Even though he was only 25 and had limited military experience, Knox was impressive enough to gain the confidence of General George Washington, and that trust was well founded. As the long siege of Boston dragged on in 1775, Knox suggested that the cannons at the recently captured Fort Ticonderoga in New York could be valuable assets. Washington put Knox in command of the expedition to retrieve the cannons. It took 56 days for Knox to lead the expedition over the Berkshires and the nearly 300 miles of wintery terrain before arriving in Cambridge on January 24, 1776. On the night of March 4, the patriots managed to sneak the cannons to the top of Dorchester Heights, a strategically important mount with commanding views over the city of Boston and its harbor. That decisive move led to the British abandoning Boston on March 17, 1776. Henry Knox birthplace site. A plaque dating back to 1911 at the southwest corner of Essex Street and Atlantic Avenue, across from South Station, commemorates the birthplace of Henry Knox, which no longer stands. Boston Athenaeum. Henry Knox was a bookseller in Boston before the Revolution. (According to Historic Mansions and Highways Around Boston, Knox's store on the Cornhill was later the site of the Boston Globe on Washington Street, which is commemorated by a plaque at 244 Washington Street.) After his death, Knox's library of 518 volumes was purchased for the Athenaeum in 1809 by William Smith Shaw. They are stored in wooden cabinets with glass fronts on the library's fourth floor, which is open only to members and their guests. Docent-led tours of the Athenaeum are giveon on Tuesday and Thursday afternoons. Bunker Hill Monument. Knox was a volunteer at the Battle of Bunker Hill. Visitors can scale to the top of the monument and then catch their breath across the street at the new museum. Dorchester Heights Historic Site. Another monument, albeit smaller than the one at Bunker Hill, soars from the summit of Dorchester Heights where the 59 cannons that Knox dragged from upstate New York were firmly fixed on the British. The tower is usually closed but there are still historical markers in the surrounding park and great vistas of the city and the harbor. Cambridge Common. It was here that George Washington took command of the Continental Army on July 3, 1775, and it was here that Knox's long journey from Ticonderoga ended as he presented Washington with the cannons. The presentation of the cannons is commemorated with a marker on the west side of the Common on Garden Street. The Knox Trail. If you want to take a road trip to follow in Knox's footsteps, then the Knox Trail is for you. It shouldn't take you 56 days to make the trek unless you're really getting into the spirit and traveling by oxen and toting some heavy artillery. The Knox Trail was laid out in 1927 and included 56 roadside markers nearby the route thought to be taken by Knox's expedition. There were 30 markers in New York and 26 in Massachusetts. A complete list of the markers can be found at this web site. Inside of I-495, markers can be found in Marlborough, Southborough, Framingham, Wayland, Weston, Waltham, and Watertown. And just this past weekend, a 27th marker has been added in Boston at the Roxbury Heritage State Park. Happy St. Patrick's, er, I mean Evacuation Day! March 17 is, of course, an unofficial holiday for millions of Americans. Except in Boston, that is, where March 17 an official holiday. For out-of-towners, I kid you not. So wait, the city takes off to celebrate St. Patrick? Well, not exactly. It just so happens that March 17 marks Evacuation Day--the date in 1776 when the British troops gave up Boston and set sail for Nova Scotia after George Washington's men seized the high ground of Dorchester Heights (in present-day South Boston). Well, then, it must just be a coincidence that a civic holiday falls on St. Patrick's Day, right? Surely the city must have had a long tradition of taking off on March 17 to commemorate the evacuation? Well, not exactly. March 17 did not become an official holiday until 1901--a full 125 years after the Redcoats set sail. By that time, of course, the massive wave of Irish immigration in the wake of the Great Famine had made Boston one of the most Irish cities in the world. Hmmm. Well, I'm sure it was just a coincidence. At least for the first official Evacuation Day holiday, the city put on its game face. The streets of South Boston were bedecked in red, white, and blue bunting; Old Glory; and portraits of George Washington for that initial commemoration. The Boston Globe reported in its March 18, 1901 issue: "St. Patrick's Day and Evacuation Day never seem to get in each others way." Well, the same can be said of the two holidays today--in the same sense that the Patriots and the Detroit Lions never get in each other's way when battling for NFL supremacy. These days, green, orange, and white are the tricolors most likely to be seen on Southie's streets on March 17, and the revelers filling the neighborhood pubs probably won't be raising a pint in honor of Henry Knox. It's somehow fitting in this intertwining of holidays that Dorchester Heights, with its commanding view of Boston and the harbor, is now in the heart of Boston's Irish enclave. The annual St. Patrick's Day Parade passes right by the mount, which is now topped by a 115-f00t monument that was completed in 1902. For those who want to start their, er, Evacuation Day frolicking early (and earn that day off with a clean conscious), head up to the Dorchester Heights National Historic Site for the commemorative exercises at the 233rd Evacuation Day Celebration at 10 AM. Put an apple pie in the oven: March 11 is Johnny Appleseed Day. Well, actually Johnny seems to be such an American legend that he gets two days on the calendar: March 11 and September 26. The September 26 date is the anniversary of his birth in 1774 and coincides with the apple harvest in New England. The March 11 date is thought to be the anniversary of his death (although other reports have it as February 18) and coincides with the growing season. Either way, whichever date you choose to celebrate ol' Johnny incorporates both birth and death themes, satisfying those who can't decide whether the glass of apple juice is half full or half empty. Now, somehow growing up around Boston, I wasn't aware that Johnny Appleseed (aka, John Chapman) came from Yankee stock. Johnny (I'll eschew the New York Times style; "Mr. Appleseed" looks too weird) was born in Leominster, Massachusetts, about 50 miles northwest of Boston. My ignorance at Johnny's local roots is certainly not Leominster's fault. Spend five minutes in the city and you'll see bushels of references to its native son. Leominster chooses to celebrate Johnny Appleseed with a festival in September (would that make them adherents to the Apple Orthodox calendar? ), but if you just can't control your excitement--or your canonical calendar celebrates his death on March 11--Appleseed pilgrims can find some sights in Leominster to visit. Just before reaching Leominster, drivers heading west on Route 2 will encounter the Johnny Appleseed Visitors Center, which just reopened a couple weeks ago. In front, you can take your picture with a young Johnny, clad in a tricorn hat, carrying a basket of apples. Inside, the rest area sells food products from local businesses, and you can find apple cider and apple crisp to fortify yourself for your trip. Just after the rest area, the billboard welcoming drivers on Route 2 to Leominster proclaims the city as the birthplace of Johnny Appleseed. (It also proclaims Leominster as the "Pioneer Plastics City." In addition to Johnny, the city was the birthplace of plastic pink flamingos, but that's a discussion for another day). Just off the highway, on Johnny Appleseed Way (naturally), you can find the spot near where Johnny was born of September 26, 1774. The site is commemorated by a granite marker and a miniature red cabin depicting what his birthplace looked like, although presumably it was a little larger. The marker actually lists Johnny's date of death as March 18, so the debate continues, I guess. While you may envision a young Johnny hiking across the country with an iron pot on his head, visit City Hall and you'll encounter a wooden statue of a grizzled Johnny with a walking stick in his left hand and a satchel of seed clutched in his right. The statue, with the inscription "Sowing West" is impressive, nine feet tall and weighing 800 pounds. It was carved using three chain saws from an ash tree that was severely damaged during an ice storm. How 'bout them apples? March 5 marks the 239th anniversary of the Boston Massacre, one of the important historical events in the years leading up to the American Revolution. 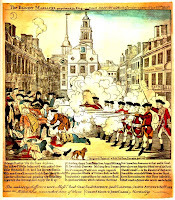 The Bostonian Society commemorates the massacre with a series of events this weekend. In the years that followed the Boston Massacre, citizens crowded the halls of Old South Meeting House on the anniversary of the event to hear Boston's greatest orators speak about freedom and democracy. Boston Latin School students will dramatize the eloquent words of orators such as John Hancock and Joseph Warren. Free; at the Old South Meeting House. Youngsters can star in a reenactment of the Boston Massacre led by National Park Service rangers. Free; on the mall outside of the Old State House. Watch John Adams defend the British soldiers accused of murdering Bostonians. Audience members act as jurors to decide whether the soldiers acted in self-defense. Free with admission to Old State House museum. Local reenactors portray the Boston Massacre outside the Old State House. Free. If you're looking for a way to commemorate the massacre on March 5 itself, visit the Boston Massacre Memorial on Boston Common. For more information on the monument's dedication (and the controversy about honoring the massacre victims), click here.